It could easily have been so different but for a lapse of Iranian defensive concentration that turned the match, against the run of play, in the Japanese favour. From that point on Japan were imperious against an increasingly emotional Iran who have now lost each of their last semi-final appearances. It was a match played at a wonderfully high tempo right from the start, there was to be no cat and mouse in this game. 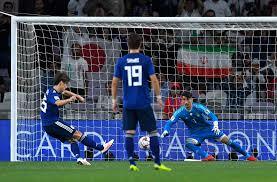 Within a minute Japan’s Genki Haraguchi had a shot blocked while a minute later Iran’s Sardar Azmoun, who in the quarter finals had terrorised the Chinese, received the ball in the box but could not get past a bravely diving Yuto Nagatomo. The first 20 minutes proved to be all Japan as the Iranian midfield, missing the hugely influential Mehdi Teremi, played too high and away from a backline leaving gaps for the Japanese to get behind. Japanese captain Maya Yoshida marshalled his defence brilliantly all evening and could have put his team a goal up with a header form a corner that went over the bar. Two minutes later the ever-busy Ritsu Doan had a left footed shot go wide of the right post. But with the Iranians working their way back into the midfield battle they began to force Japan to give the ball away cheaply and start to exert pressure of their own with their close, fast passing game. A series of free kicks were easily dealt with by Yoshida and his imposing defence, while long shots from Ehsan Haji Safi either side of half time never got close to troubling Nagatomo. The first 10 minutes of the second half saw Japan camped in their own half until Japan counter attacked with just their second incursion into Iranian territory. And what a disaster it proved to be for Iran. Takumi Minamino raced with the ball into the Iranian box and brushed with Hossein Kanani sending him flying on his front. While Kanaini turned to protest to the referee Minamino rose from his belly slide to chase the ball down and cross to Yuko Osako who headed in. The Iranians could barely believe what had happened. It was both a lesson for every footballer not to give up, and the game changing moment of this match. Japan were a goal up and despite Iranian coach Carlos Queiroz making immediate changes were back in control of the game that looked to have been slipping away from them. Osako, who was making his first start in the tournament since sustaining a hip injury in the opening game, struck again eight minutes later. Minamino again on the left crossed only to hit the arm of sliding defender Morteza Pouraliganji, VAR confirmed the penalty and Osako coolly slotted the ball home to Iranian keeper Alireza Beiranvand’s left as he dived right. Iran huffed and puffed and threw everything they had at japan but they couldn’t get the ball near enough to Japan’s goal to seriously threaten. Their misery was complete when in the first minute of added time they lost the ball inside their own half with it falling to the feet of Haraguchi who beat two players on the left and hammered the ball left foot past Beiranvand for 3-0. Iran who had been so impressive in this tournament and had not conceded a goal until this game were suddenly out. Japan, who until this game had won every match by a single goal, have been impressively building their campaign. They have made it through to the semi-final stage of the competition in six of the last seven Asian Cup finals tournaments. Iran, who play with their hearts on their sleeves, will rue the emotional side of their game and Kanini’s turning to the referee rather than turning to chase the ball down. It could have been so very different.